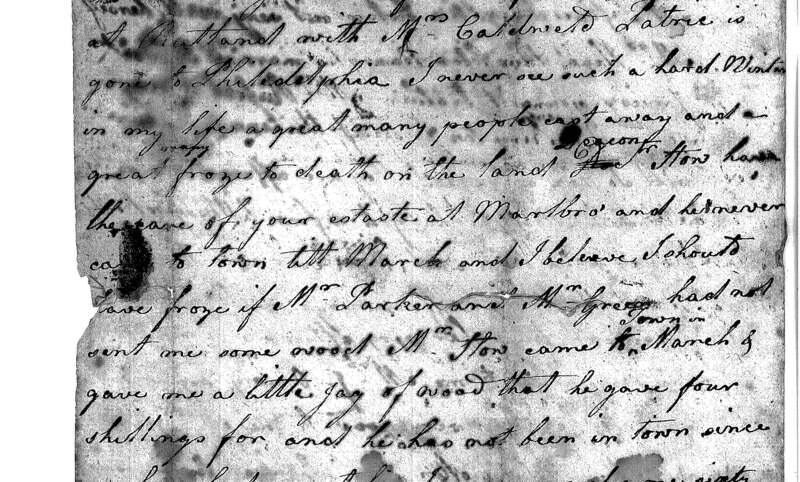 Among the Deborah Barker letters to Christian Barnes in our archives (see post of October 28) is a well-worn manuscript dated May 13, 1787. It is signed “Daphney,” and was originally indexed as authored by “Daphne Barker.” Indeed, Deborah Barker’s frequent references to Daphne in her own letters call up the image of an elderly aunt who visits her Hingham relations from time to time. But there is no Daphne in the Barker family tree. We started looking at the Barnes family and, before long, realized that Daphne was the Barnes’ former slave, left behind when Loyalists Henry and Christian Barnes fled to England in 1775. Daphne appears to have come to Hingham in the summer, as reflected in repeated references in Deborah Barkers’ letters: “[Daphne] continues her annual visits to Hingham and we are fond of seeing her” (Aug. 5, 1783); “I expect [Daphne] every day as I promised to write for her as soon as I returned from my journey” (June 1788); “she spent a month with us the summer past but grew impatient to go home” (Nov. 12, 1790). The letter in our archives was undoubtedly written on one of Daphne’s visits to Hingham. Further research is needed to discover what Daphne’s ties were to Hingham. Was she related to one of the Barkers’ slaves? Was she raised on the South Shore? Even without full context, her letter allows us to hear the voice of an individual which might otherwise have been lost and to ponder relationships we have trouble understanding. This entry was posted in Uncategorized and tagged African Americans, Archives, Barker family, Boston, Christian Barnes, Daphne, Hingham, letters, slavery.